… it’s Scouts meeting requirements with the support of adult volunteers – in Scout advancement we are all on the same side. We did not write the requirements. We don’t personally embroider patches to present to them. 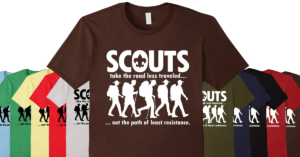 It’s tiresome and self-defeating to devise our own hoops for Scouts to jump through or impose our judgement on Scouts. Most advancement requirements are defined metrics, a few are judgement calls. 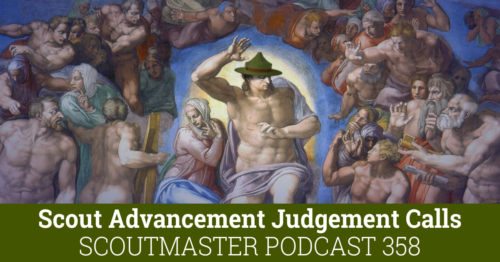 There are two basic approaches to advancement judgement calls. The first is establishing a metric all Scouts must meet. The Second is setting an individual goal in consultation with the Scout. Having tried both approaches I strongly prefer setting an individual goal with, rather than for, the Scout. The whole thing should take about ten minutes. Sit down and talk to the Scout about the goals he would set for himself to fulfill the “active” and “responsibility” aspects of the requirements. Listen carefully before you speak. Ask him to explain how he arrived at that goal. See if it makes sense to you, and if it doesn’t ask more questions. If you do more listening than speaking you’ll get some insight into his life and help him find a way to make things work. [03:14] I think mom and dad doing too much of the merit badge work and he is not getting anything out of the program. What do I do? [07:26] We have an ambitious Scout with ambitious parents driving hard for Eagle, the Scout is involved in many other activities and there are concerns about being active and fulfilling the leadership requirements.